Wonderful day trip, the highlight must be a trip by boat to the foot of the falls. The only reason for not giving a higher rating is that the light show was almost non existent. Highly recommend this tour, it was amazing and very professional. The trip was amazing. The tour guide was very good. The horseshoe rapids were very good and a nice little shop. The trip to the falls was nice with lovely scenery. The falls were amazing seeing them during the day.The trip on Boat was amazing and I enjoyed getting close and wet. The meal was very nice. The falls at night with the extra fireworks was truely amazing. I loved the tour would recommend this tour. Excellent tour. We travelled early afternoon and did the boat trip to the falls in daylight and then saw the lights in the evening after nightfall from Niagara town which I would recommend as you get best of both worlds and being up close to the falls in daylight is probably a better experience. We had excellent driver and tour guide who was very knowledgeable. Drive to the winery and through the village of Niagara on the Lake was a great additional part of the day and the meal we had in Niagara, at the Sheraton, was superb. Great day and thoroughly recommend it. We enjoyed this tour and David our guide was excellent however, the description of the tour on Viator is misleading. It states the tour is approximately 9 1/2 hours. It was 11:45 before we were dropped off at our hotel and even later for those who were picked up at the bus terminal for the 1:00 tour commencement. 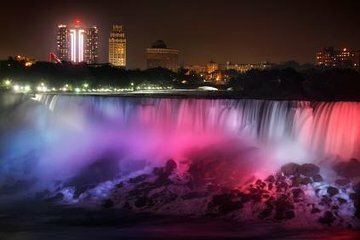 The description gave the impression that we would be dining while viewing the illuminated falls. This was not the case. We ate first and took the cruise afterward. 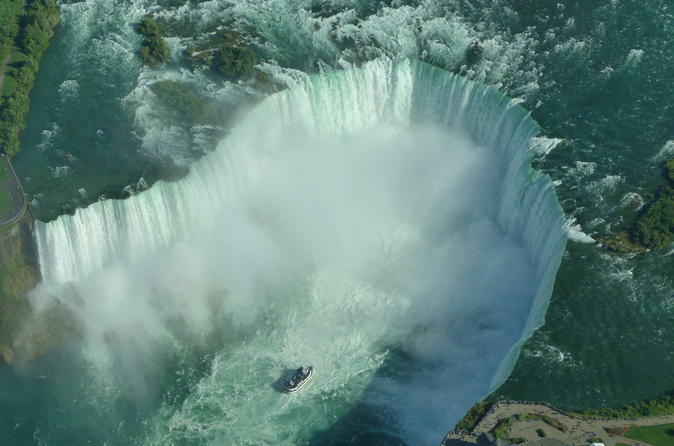 It was not possible to take a promenage along the deck as you float along the majestic Niagara River and if you stayed inside to avoid getting wet you could not admire unobstructed views. We definitely did not view the Whirlpool Rapids, but only saw the American Falls, Bridal Vail and Horseshoe Falls. After the cruise we had two hours of free time. I would have preferred spending those two hours visiting additional wineries or returning to our hotel earlier.